Royal Optix (Brooklyn) - Book Appointment Online! 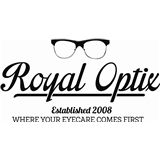 Royal Optix wants to set itself apart from other vision/optical service facilities that may offer only one or two services. While our family were in this business for some time we realize that some people need to have a full service office, so they will not spend their time going to different locations to be fully eye examined or choosing eye wear for their need. The service we providing includes: basic and comprehensive eye examination by licensed Doctor - who also has experience in vision field over 20 years. To addition to regular exam we provide different kinds of tests that would determine and prevent different kinds of disease and dysfunction such as Macular degeneration, Glaucoma, Cataracts, Conjunctivitis, Retinal Disorders that unfortunately are very common in senior citizens. Some treatment will also be available in office. Contact Lens fitting and evaluation is available. I was very impressed with Dr. Sall. She is very professional, intelligent and knowledgeable and takes time to answer questions and make you feel valued as a patient.